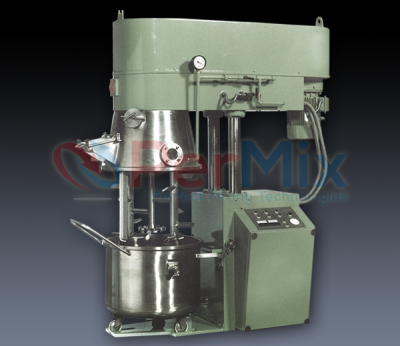 The PerMix PDP series Double Planetary Mixer is also called double planetary kneader, because it can be used to handle very viscous materials up to 1,500,000 cPs. Usually the PerMix PDP series Double Planetary Mixer has two vertically mounted mixing tools which are driven by one gear to move around the the central axle of the tank as well as their own axles. The PerMix PDP series Double Planetary Mixer is so versatile that it can be used to mix, knead, stir and deaerate all types of material, including highly viscous pastes, even to granulate wet powders. 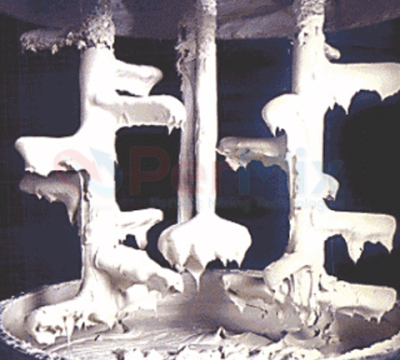 Industrial pastes produces by the PerMix PDP series Double Planetary Mixer include concentrated paints and varnishes, printing inks, fillers, silicone and thiocole pastes, plastisoles, plastic coatings, synthetic lubricating greases and many other materials. In the mixing process, two vertically mounted mixing tools rotate around a common sun gear. In addition, they rotate at a higher speed around their own axes, according to the planetary principle. A swinging type scraper continually sweeps the inside wall, transporting material from the walls of the vessel to the mixing tools, and transferring the heat efficiently. The standard finger-blade mixing tools are designed to work in an overlapping way, thus create strong axial and radial motions in the mix-product, as well as a highly intensive shearing and dispersing effect. 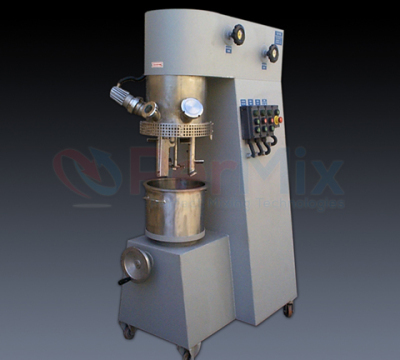 Within a short time, the material is thoroughly mixed and even very difficult formulas may be obtained. A quick vessel locking device connects the mixing vessel to the mixer. Because the vessel is mounted on fixed and swivel wheels, it is very easy to transport. The standard version of the PerMix PDP series Double Planetary Mixer features dual mixing tools shafts running in heavy duty ball bearings. Both mixing tools and scrapers can be supplied with a special bayonet locking system for easy dissasembly. The upper head of the machine is lifted by manual, mechanical or hydraulic elevating systems, depending on the size of the machine. Electrical TEFC single speed motors are the standard drive units supplied with PerMix PDP series Double Planetary Mixer. Ex-proof design motors and gearswitches are also available. Among the many options available for special applications are: infinity variable speeds, two speed drives, hydraulic drive units, heating/cooling jacket, vacuum/pressurized operation, etc. For mixed products that must be heated or cooled, PerMix has designed jacketed vessels for hot oil, electrical heating, steam heating and liquid cooling. 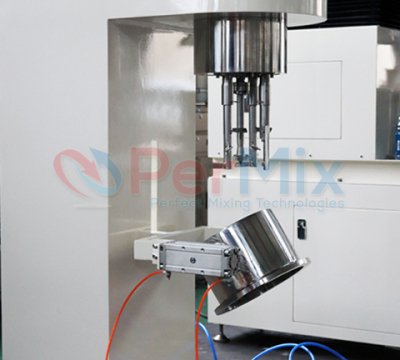 PerMix has designed moveable and tiltable mixing vessels, with or without a bottom discharge valve for less viscous liquids and units with a special no dead area valve for connection to peripheral equipment. Arrangements can be made for the transport of the vessel by forklift or by crane. 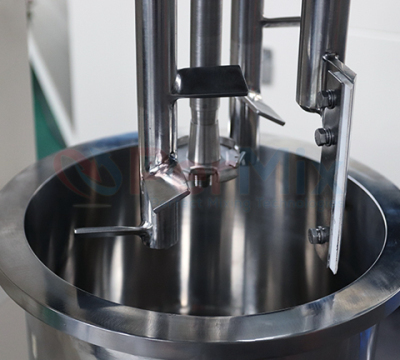 Where necessary, alterations can be made in the shape of the mixing tools; a third mixing tool may be added; a homogenizer unit (with deflector) can be supplied - and other performance proven mixing elements may be supplied for special duties. 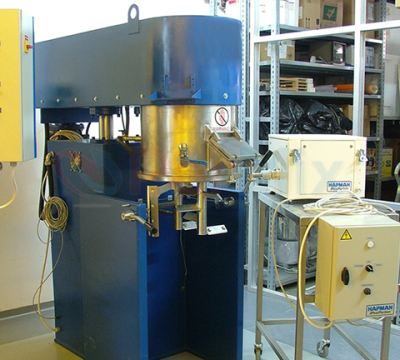 A PerMix DISSOLVER UNIT for fine dispersion, with its own drive unit, available with or without variable speed, has proven itself a good process accelerator for dealing with special dispersions.